So……here we are again, geared up and ready to start the hunt for that elusive Champions League trophy…..or are we? I can’t speak for others but i’m still feeling somewhat uninspired ahead of this seasons European campaign. It’s a combination of the departure of certain players, the lack of a big money signing in midfield (yes, I am used to being spoiled by Beppe and Fabio) and of course, that final 45 minutes in Cardiff that still haunts me every time someone mentions the words ‘Juventus’ and ‘Champions League’ in the same sentence. For me, some of the enthusiasm has gone and despite the prospect of facing a European giant like Barcelona on game day one, i feel strangely calm and serene, with a thoroughly different mindset to seasons past: What will be will be. The marketing machine, the social media overload, my own arrogant preconceptions about facing a side like Real Madrid all contributed to a belief that it was genuinely going to be our time when we headed to Cardiff. We had everything needed in terms of the starting XI on the pitch, but more than that, we had a plan, a formation that worked and players that had absolute belief in one another and the coach. They were confident and assured, as they rightly should have been, and yet somehow it wasn’t to be. The rumours continue to this day about what may or may not have transpired at half-time at the Millennium Stadium, all of which you know too well, so i won’t bother going over them. Sufficed to say, I won’t be buying into the hype this season, nor getting too carried away with strong team or individual performances, nor any words from the players about lifting the trophy. I will believe we can win the Champions League if the full time whistle blows at Olimpiyskiy Stadium in Kiev on 26th May 2018 and Gigi Buffon is holding the trophy aloft – Not a second before then. Don’t get me wrong, I’m not a pessimist by nature – I prefer to look at the positives in any situation, but 20 years of supporting this beautiful team has given me highs and lows, but it hasn’t given me a Champions League trophy. Of course, I know we will probably win it at some stage, and i’ll happily celebrate the moment, but until then, I’ll keep my expectations in check and cheer the team of my heart, regardless of the outcome. Sentiment over and done with, there have been some truly encouraging signs so far this season. Granted, we have only faced the likes of Genoa, Cagliari and Chievo, all sides we should be beating comfortably, but the manner of victory, particularly against Genoa, gave some indicator of how tough this side can be. The fightback in Liguria really impressed and while it took the whole team to complete the comeback, it was Paulo Dybala’s resilience and grinta that left an impression. The 4-2-3-1 system is working well for us and it was encouraging to see Allegri try something different by fielding a 4-3-3 in the 3-0 victory over Chievo last weekend. Miralem Pjanic seems to be flourishing for having a more industrious, hard-working type next to him in the shape of Blaise Matuidi, who has hit the ground running, playing box-to-box with a kind of energy and determination that I haven’t seen in a while. It’s still early days, so it’s important not to get too carried away, but the signs are good. The depth of the squad has come to fore early on – Consider that through injury or being rested, Juve were without Giorgio Chiellini, Claudio Marchisio, Andrea Barzagli, Sami Khedira, Gigi Buffon and Alex Sandro while Benedikt Howedes and Mattia De Sciglio are yet to debut and Dybala, Federico Bernardeschi and Rodrigo Bentancur were only used for the closing part of the game. It’s a testament to the management that while they weren’t able to get the kind of big-name signing many Juventini were hoping for, they were still able to massively upgrade the roster and give us cover in every part of the pitch. Heading to the Camp Nou, Juve are without Chiellini, Khedira and Marchisio who have all been left out of the squad due to injuries, along with Mario Mandzukic who picked up a knock in the victory over Chievo while Juan Cuadrado is suspended for the match. Despite the absentees, it leaves the starting XI pretty open. There’s been some suggestion that in the Italian press that Rodrigo Bentancur could start, but that seems a strange choice from Allegri, given that he prefers to ease the youngsters into the team. That said, Stefano Sturaro played his part against Real Madrid a few years back so the lack of options in midfield could force Allegri’s hand. The coach was surprisingly coy in his press conference, confirming only that Andrea Barzagli would start the match, but that could be at CB or RB. Given the options available, I think Gigi Buffn will start in goal, with Barzagli, Benatia, Rugani and Sandro at the back. Pjanic and Matuidi will likely start in midfield with Douglas Costa, Dybala and Sturaro ahead and Gonzalo Higuain leading the line. 4-2-3-1: Buffon; Barzagli, Rugani, Benatia, Alex Sandro; Matuidi, Pjanic; Douglas Costa, Dybala, Sturaro; Higuain. 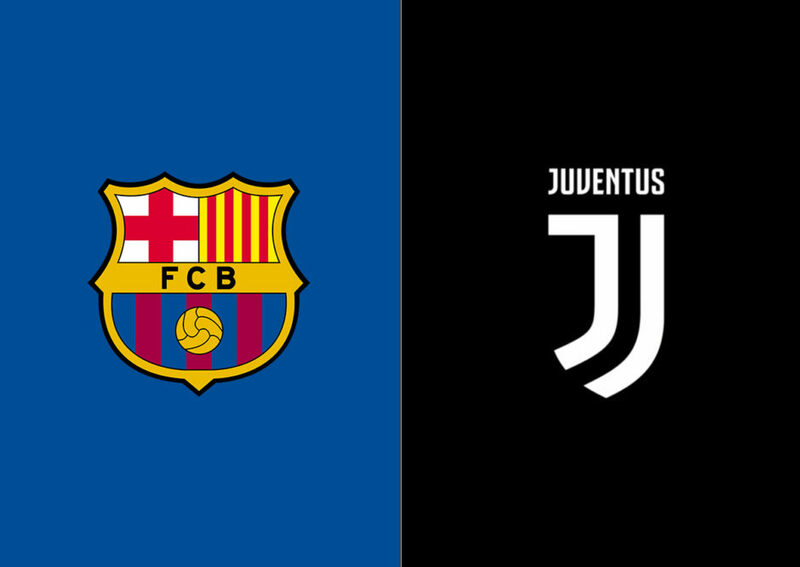 In their first match in this season’s Champions League, Barcelona take on Juventus in the Camp Nou. Its very fitting since Barcelona’s exit from the Champions League last season happened after the same match. A lot has changed since then. Barcelona have lost their second best player and one of the best players in the world making them relatively weaker. That said, having Neymar or not last season made so little difference. Juventus were a unit in defence and they were almost impossible to penetrate. Similarly, Juventus lost Bonucci but there is no doubt their system will prevail. This match is Barcelona’s first tough match of the season considering that the Supercopa is considered part of the preparation stages. To many, this match will give fans an idea of what’s to come and it will give the coach several ideas of what to change or improve. Barcelona go into the match with no starters or important players being injured. Sergi Roberto was left out of the squad which faced Espanyol out of precaution but he’s good to go while Rafinha and Arda Turan continue to recover from their injuries. Luis Suárez recovered this past week and was given the green light to play in the Catalan derby, a match which Barcelona won 5-0 in thrilling fashion. After the Catalan derby, Barcelona got a much-needed confidence boost to kick off the season. That said, there is a lot more to prove. A team like Juventus will be a true test and the fact that the first match is at the Camp Nou keeps the players relatively calmer. As usual, Ter Stegen is expected to start with Jordi Alba, Pique, Umtiti in front of him. The fourth spot in defense is for the undecided right back. The position is still unclear because Valverde has given both Vidal and Semedo equal chances to convince. The obvious conclusion, based on their performances during these past few weeks, is that Semedo will be Barcelona’s main right back for the season. In midfield, Barcelona will always depend on Busquets. Iniesta’s experience will be of major importance so him starting the match is a must. The third position in midfield is a bit vague even if Rakitic has been starting recently. Barcelona’s bench has players like Gomes, Paulinho, and Denis Suarez; Valverde could possibly put his money on Gomes or he could even surprise us all and go for the ‘awaited’ 4-2-3-1 formation which would really crush any lineup prediction. 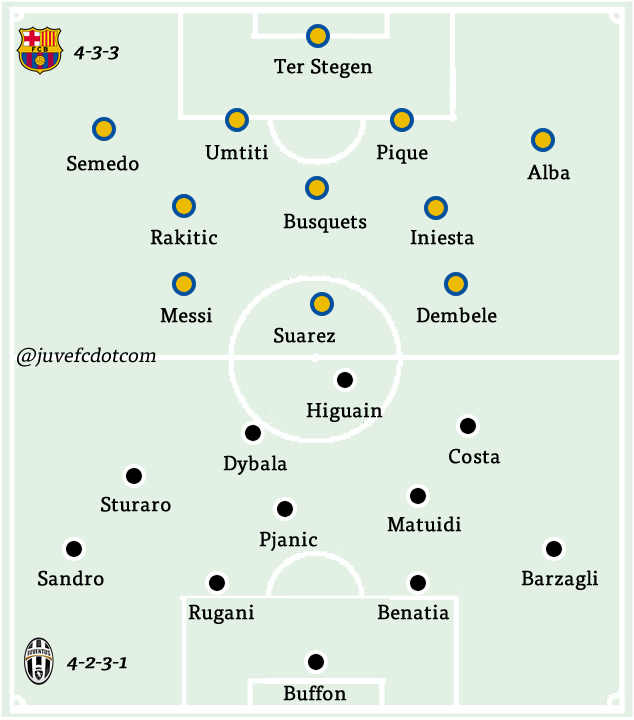 The safe conclusion says that Barcelona will go into the Juventus match the same way they went into the Espanyol match with Busquets, Iniesta and Rakitic in midfield. It is the midfield with the most chemistry after all. Obviously, Messi and Suarez are untouchable up front. The truly exciting question for Barcelona fans is the following: Will Valverde actually involve Dembele in such a match from the beginning? He just played a couple of minutes against Espanyol and seems pretty fit. After all, if Dembele was going to get a chance to impress against a big side, Juventus in the first match of the group stages is an intense yet safe opportunity. Deulofeu has been starting recently and he hasn’t been doing so bad himself. Valverde will soon enough replace Deulofeu with Dembele as the main starter. It is just a matter of when. Barcelona and Juventus have an exciting recent history with Barca defeating Juve in the 2015 Champions League final. Last season, Juventus eliminated Barcelona from the quarter final keeping a clean sheet over two matches in the process. Both teams have the same yearly objectives: They are both going for all three trophies and a match of this magnitude will truly help them both know where they stand in this part of the season.